If your taste buds are only excited by the occasional fine-dining experience in your local restaurant, then we would encourage you to try a new taste sensation – Wagyu Beef. This unique luxury product can now be enjoyed from the comfort of your own home by ordering it online at www.jameswhelanbutchers.com. Wagyu beef originated in Japan as a working animal and over time became the culinary delicacy it is today. The word ‘wagyu’ translated into English, actually means ‘Japanese Cow’, ‘wa’ meaning Japanese and gyu meaning ‘cow’. 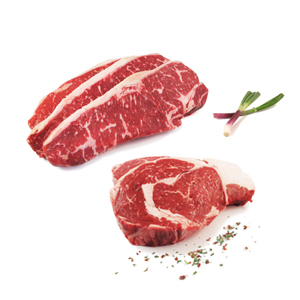 Wagyu beef is considered the epitome of beef steaks by beef connoisseurs and is hailed the world over for it’s unique textured flavour. At James Whelan Butcher we bring you the very best of wagyu Striploin and Ribeye Steaks, prepared in store by our craft butchers. Our wagyu cattle are raised on a traditional diet of organic grains to give an authentic fullness of flavour and tenderness. During cooking the high concentration of inter-muscular fat or marbling melts, marinating the wagyu beef from the inside. Extensive studies from universities in the USA have shown that wagyu beef has major health benefits as part of a balanced diet. The high level of unsaturated fats and CLA (Conjugated Linoleic Acid) which is said to boost the immune system and also helps lower cholesterol as part of a balanced diet to fight diseases like diabetes and heart disease. This high level of healthy mono unsaturated fat means that it contains fewer calories than other fats found in different types of beef products i.e. butter, cream. The presence of these mono unsaturated fats gives wagyu beef a unique chemical composition which translates to a much lower melting point during cooking time than other strains of beef. This lower melting point creates the buttery tenderness synonymous with wagyu beef. We have also developed our unique wagyu burger capturing all the flavour and texture of wagyu beef, we have blended a subtle seasoning which enhances this product. This uniquely crumbly burger is very easy to digest and is an ideal product for kidults. This might just be the best burger on the planet. The secret is the intense marbling that the Wagyu breed produces. 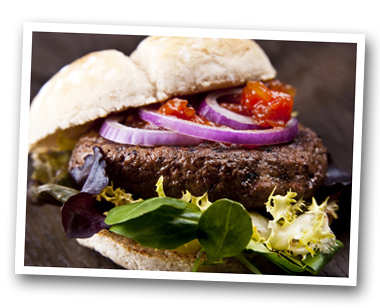 Add a slice of gorgonzola, a heritage tomato and your favorite sauce for the perfect burger.